The perfect Highland escape from it all - exploring Camusdarach, Mallaig, Glenfinnan and beyond. When life gives you lemons, make lemonade. It’s a brilliant piece of advice. When California dreaming becomes a nightmare! I’d been asked by a car dealership to take one of their hire vehicles on a Scotland with The Wee White Dug adventure. The vehicle they wanted me to review was a VW California Ocean camper. A road trip in a VW camper has been on my bucket list for as long as I can remember. We were super excited when we arrived at the dealership on Good Friday to collect our wheels, but there was no VW California Ocean waiting for us. After a half-hearted and sheepish apology we were advised they only had a VW California Beach available. The Beach lacks all of the Ocean’s mod cons. There’s no fridge, cooker, sink, storage space, back-up power supply, or automatic lifting roof. I couldn’t hide my disappointment. Without a fridge our food would go to waste – money down the drain. Not an acceptable way to treat someone you expect to produce glowing digital content for you. We set off feeling flat. I’d imagined us happily singing along to the playlist I’d compiled. 85 miles in, wondering how we’d manage on a camping trip without as much as a kettle, camping stove or mug to our name we turned to head home. A few miles later we realised our weekend was in danger of becoming a write-off. A quick u-turn, and we were heading north once more – uncertain how, or where we’d be spending the weekend. With hindsight I wish we’d never set off in the camper. I’d been caught completely off guard when the dealership dropped their bombshell, and had been trying to remain professional and positive. We’d miss our own trusty car, but the weekend was still ours to enjoy, and that’s exactly what we’d do. Arriving at Glen Nevis Campsite mid-afternoon, we checked-in, drove to our pitch, then straight past it never to return! The unadulterated joy of picking up a phone signal when you least expect it should never be underestimated. Dwarfed by the mighty mountains of Glen Nevis I struck gold. “4G, ya dancer”. Five minutes of Googling later, we were on our way to Fort Augustus – so elated, we were humming along to my playlist. Pulling up outside The Inch Hotel I felt like an excited five-year old on Christmas morning. It was a grand, old building with views of Loch Ness. Inside it was a typical Scottish country house hotel with a roaring log fire, and a well-stocked whisky bar. Our room was a tasteful blend of modern and traditional. Cushions and throws complimented beautiful antique furniture. As we’d spent the day driving, we decided to have a potter around Fort Augustus before dinner. Outside, a cold wind was whistling down the Great Glen. It nipped at our noses, but we didn’t care. We’d just dodged spending the night in an empty shell of a van with no camping equipment, bar our own sleeping bags! We followed the Caledonian Canal uphill though a series of locks, and bumped into Loch Ness’s most famous resident. Back at the hotel, the staff kindly set us up a table in the bar so the boy could join us for dinner. The Inch may be a 3 star hotel, but their Head Chef Phil Carnegie produces incredible 5 star food. We started with locally picked wild garlic and potato soup with ricotta. It was delicious. For main, meat lover Mr G had Loin of Lochaber venison, haggis, potato terrine, salsify, roasted carrots and Laphroaig jus. I chose a veggie dish of Aubergine, lentil and sweet potato cake, roasted cauliflower, natural yogurt, sprouting broccoli and coriander. Both dishes were lovely. The boy wasn’t left out either – he tried some venison and cauliflower. As soon as we spotted the words peanut and butter on the menu, choosing dessert was easy. The peanut butter and chocolate ganache with peanut butter cream, salted caramel ice cream and caramel gel sent us into raptures. We ended our evening high on chocolate, tipsy on wine, and delighted that we’d discovered such a wonderful hotel. The next morning, after a breakfast of porridge, pastries and coffee we were on the road again. We belted out David Bowie’s ‘Life on Mars’ as we drove towards Glenfinnan. We arrived at the Glenfinnan Visitor Centre bright and early, and made our way up to the viewpoint. We got it all to ourselves, so we lingered to make the most of our good timing and the incredible view of Loch Shiel and the Glenfinnan Monument. As we descended we passed a coach load of tourists puffing their way to the summit. Next, we headed over to the iconic Glenfinnan Monument. The monument commemorates the Highlanders who died fighting for the Jacobite cause. It stands at the spot where Bonnie Prince Charlie raised his father’s standard in 1745. 1,500 rallied to his call. Less than a year later many lay dead on Culloden Moor. Mr G climbed it, while I waited at the bottom with the boy. I’m not a fan of heights, but I decided to brave the monument too. It took no time at all to climb the stairs. To reach the viewing platform you have to squeeze though a small hatch. It was a leap of faith too far for me, as to climb out I’d have needed to let go of the handrail in the tower. I settled for a half way approach – half in, half out! I said hello to the Highlander at the top and snapped a photo. It was unlikely I’d ever get so close to him again! Back at ground level, we strolled by the shore of Loch Shiel and The Wee White Dug enjoyed a paddle. He never misses an opportunity for a dook. After the boy had finished paddling we walked up to the Glenfinnan Viaduct. The viaduct was built in the late 19th century, and while it may look like it’s made of stone, it’s actually (quite surprisingly) made of concrete. The steady stream of people heading uphill told us something was afoot. We followed them, and found a vantage point overlooking the viaduct. A familiar whistle cut through the air, and a puff of smoke appeared in the distance. I felt a flutter of excitement – The Hogwarts Express was coming! The Viaduct and The Jacobite steam train aka The Hogwarts Express appear in the Harry Potter movies. Ever since its movie debut the viaduct has become a pilgrimage site for Potter Heads hoping to catch a glimpse of the magical steam engine. It was an amazing sight to witness – we were absolutely buzzing afterwards. A coffee from the visitor centre was probably the last thing we needed, but we had one anyway. As we drove towards Mallaig, skirting Loch Eilt, we spotted The Jacobite on the other side of the loch. When we pulled ahead of it we couldn’t resist stopping in Morar to catch it arriving in the village’s tiny station. After a morning spent trainspotting we arrived in Mallaig at the same time as The Jacobite. I couldn’t help smiling when I spotted little witches and wizards disembarking. We decided to have lunch at the Chlachain Inn as we’d stayed there during the rainy summer of 2016 so knew the food was good. It was potato and leek soup for me and Cullen skink for Mr G. Mr G declared his soup the best Cullen skink EVER! My tattie and leek was pretty damn fine too. I’d booked Camusdarach Campsite a couple of days earlier. I had a hunch we’d adore it (even enough to spend a night with no camping equipment, in the tent on wheels from ‘Bag of Crap Camper Co’) – I was right. Arriving at Camusdarach we were warmly welcomed and given directions to our pitch. It was a stone’s throw away from one of our favourite Scottish beaches – Camusdarach. We even had a sea view. We headed straight to the beach. The boy was in his element, and bounded into the sea. I found a stick and we enjoyed a high-spirited game of fetch. We could see the isles of Eigg, Rum and Skye in the distance. At that moment, there’s nowhere on earth I’d rather have been, than on that stunning Scottish beach. By late afternoon we’d racked up over 20,000 steps and were ravenous. We left Camusdarach to drive the short distance to Mallaig for dinner. We were belting out Meatloaf’s ‘Paradise by the Dashboard Lights’ when the horizon caught our attention. Was that a hint of orange in the sky? Would we be treated to a spectacular West Coast sunset later? Mallaig was as calm as a millpond when we arrived. Mr G popped into The Bakehouse & Crannog to get us take-away pizzas, while the boy and I amused ourselves with a spot of seagull watching. Those pizzas were up there with the best we’ve ever eaten. From the sourdough base, to the delicious toppings, you’d be hard pushed to find better pizza, even in Italy. We’d expected to spend our weekend cooking simple meals in a camper van, but instead it had turned into a gastronomic Highland tour. Back at Camusdarach it was time for another visit to the beach. Before we even got there it was clear we were going to witness an awesome sunset. We found a good vantage point and watched in awe, as the sky glowed a warm orange colour, before burning like fire. We stood gazing west, feeling euphoric. It was one of those truly incredible ‘la vie est belle’ experiences. After enjoying the sunset we were confined to the van for the night. Luckily, we were still in a heightened state of euphoria! Plus, I’d packed a battery operated fibre optic lamp AND light up champagne flutes. We may not have had a cooker, fridge, or even basic camping equipment but we had the ability to glow in the dark, so all was good. That night sleep didn’t come – we were freezing cold and incredibly uncomfortable. We huddled together like penguins for warmth, willing morning to arrive. When morning arrived we were instantly cheered to find the sun shining and a chocolate egg outside. The egg had been delivered by the Camusdarach Easter Bunny – such a lovely gesture. We feasted on a breakfast of warm, homemade croissants, pain au chocolat and fresh coffee, bought from the campsite shop. It was perfect, and as we sat there enjoying the view, the memory of our uncomfortable night melted away. It was time to go home, but we were in no rush to leave this little corner of paradise. With the sun shining, and the sky blue, there was time to enjoy one last walk on the beach. This time, we visited the Silver Sands of Morar. I’ve never seen it looking quite as beautiful as it did that gorgeous Easter morning. Our feet sank into the soft, white sand as we walked. Did we really have to return to city life quite so soon? It seems the boy didn’t want to leave either. When I called him to put his lead on he ignored me and toddled off to explore a corner of the beach we’d missed. That’s my boy. We decided to take in one final scenic spot before leaving – Loch Morar, home of Nessie’s monster cousin Morag! It looked grand. Ok, I lied. We stopped to admire this view of the Lochaber Geopark too, but who could resist? Oops, stopped again! A snowy Ben Nevis and a beached boat were crying out to be photographed. Finally, we were on the road again, heading for home and singing Willie Nelson’s ‘On the road again’. We sang our socks off during that fantastic weekend. When our weekend started with lemons, I’d never have imagined we’d turn it into lemonade. I’ll tick that VW camper trip off my bucket list one day, and when I do it’ll be fan-blooming-tastic. What a fantastic road trip, even if it did get off to a bad start! I think that photo of the wee white dug with Loch Shiel is my favourite photo of him yet. 😀 I must get back there, it was on-and-off raining when I went and we had a mix of lucky and super unlucky with our timing – it stopped raining just as we arrived and loads of people were coming down from the viewpoint so we had it all to ourselves and I got some incredible moody photos. Of course, the reason they were coming down was because we had missed the Jacobite by two minutes. We watched it leave Fort William though, so not all was lost – and I even got up in the engine before it left! Such beautiful photos, as always! First time I visited your blog and I loved this fabulous account. It made me want to fly over immediately! Your photos are amazing too. Thank you and welcome to the blog. Maybe it’s time for a visit to Scotland? That was a bit rude of the car dealer – but yes, a fine job you both did of turning lemons into lemonade. A tremendous trip and I do so lurve the wee white dug. The “Hogwarts Express” is fantastic. I have been over that viaduct, many years ago. Still having problems with this computer but did get to see all but the last four photographs. Great post – as usual. We visited Scotland in 92 with friends, and ambled all over. Now we have our own WWD, so your stories and pictures really make me want to return. Adore your photos!!! The colours are amazing. One question though – how did you get the WWD to retrieve??? Beautiful sunset and beach photos toward the end. Lovely! Great road trip & pics. But you somehow managed to miss out Arisaig & a few other delights along the way. Maybe go back in June,the best time of year? Disappointed. Biggest understatement ever. However, it is their loss and should be a lesson learned on how not to treat bloggers, influencers and content creators. I love that you still made something out of your weekend. Good to see you are counter acting all your steps with filling your faces with pizza. Great skills. My 20k steps were a drop in the ocean after our bean feast weekend but it was worth it. 😜. It was hugely disappointing to use up annual leave and arrive with a bag load of fresh food and absolutely no camping equipment to find out they’d hired our van out. I’d have respected them more if they’d let me know the day before, but they didn’t. They let us waste money on food and turn up ill equipped. Even if they’d got a hold of a travel kettle, camping stove, crockery and a chill box I’d have thought at least they’ve tried to redeem the situation. I think that’s the best description of a trip yet! You visited all my favourite places. Great shots of the Jacobite and sunsets. Thank you, not the weekend we’d planned but unbelievably good. Loved your blog. Photos were amazing too. I miss the views up there. 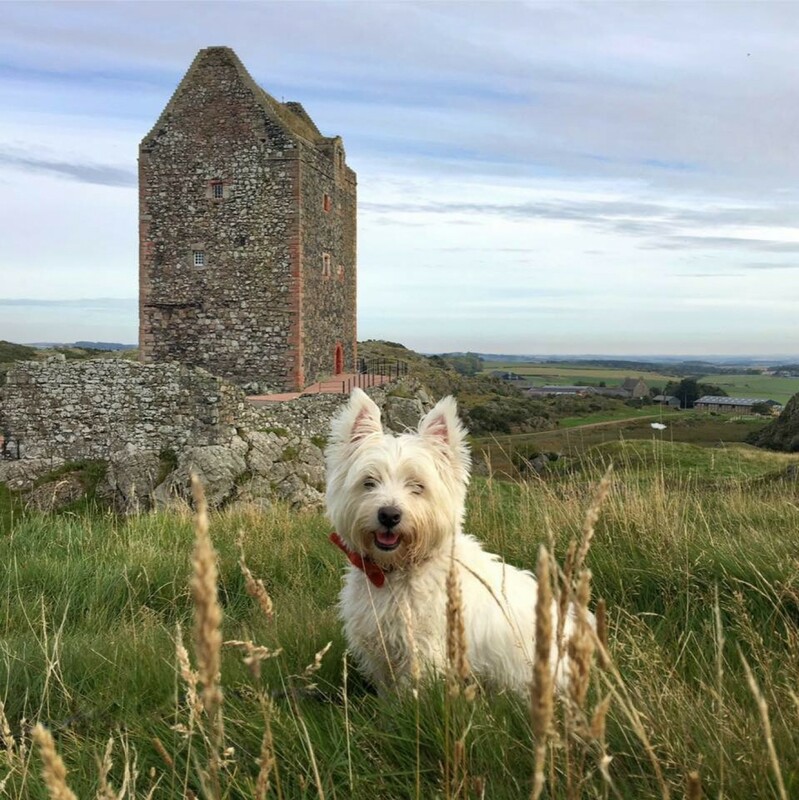 Your adventures are fab and your wee white dug is so sweet. Thank you. I can thoroughly recommend watching The Jacobite cross the viaduct. It’s a magical sight to see. Amazing pics and a great blog, always good to see Davy Diver looking so well at Silver Sands. AND you made it over the rocks to Tougal Beach, every childhood holiday right there, staying in one of the tiny wee cottages – heaven on earth. My wee grumpy face in the twitter profile pic was just put on – I didn’t want to pose for a photie, I wanted to play! Thank you. I love that boat. Even on a dull day it adds a gorgeous wee pop of colour. Ha ha I remember having to pose for childhood holiday photos myself. I was always waaaaaay too busy having fun. That is the perfect attitude to turn that frown upside down. And you got one of those spectacular sunsets the Road to the Isles is famous for. Fabulous writeup! Casper is looking so dapper. And the shot of the Jacobite is jawdropping!! Thank you so much. Nothing beats a good sunset. It was so lovely to see The Jacobite too, as it was just down to lucky timing.